alaTest has collected and analyzed 331 reviews of Sony DCR-TRV33. The average rating for this product is 4.0/5, compared to an average rating of 4.1/5 for other Camcorders for all reviews. People really like the size and price. The image quality and portability also get good feedback. We analyzed user and expert ratings, product age and more factors. Compared to other Camcorders the Sony DCR-TRV33 is awarded an overall alaScore™ of 78/100 = Good quality. 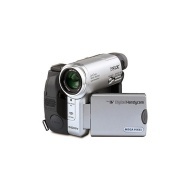 Sony DCRTRV33 MiniDV 1megapixel Camcorder with 2.5" LCD, Color Viewfinder & Memory Stick capabilities. Good picture quality and features. Early imaging chip failure.Obtuse owners manual. A camera that does it all....with a touch screen! No in-built flash, Poor Battery Life. The DCR-TRV33 is a spectacular option for those looking for great video and stills in a compact camcorder. Offering a 1.0 Megapixel CCD imager, this high quality camcorder delivers 10X Optical/120X Digital Zoom and Carl Zeiss optics for incredible picture clarity. The 1/4.7" Advanced HAD (Hole Accumulation Diode) CCD imager with 690K (effective) pixels provides excellent detail and clarity, with exceptional digital video performance (520 lines of horizontal resolution). Realize great looking digital still images utilizing 1000K (effective) pixels. The Megapixel technology enhances your digital videos and digital still photography performance. The MiniDV digital recording format delivers 3X the color bandwidth of VHS and lower signal to noise ratio compared to analog formats, providing stunning video performance comparable to DVD. Ultra Compact Design This new, unique design complements the product's ultra compact size while providing easy, comfortable access to the video controls. The Professional Quality Carl Zeiss Vario-Sonnar Lens has an advanced optical multi-layer coating offering less glare and flare with increased contrast. This results in vivid image brilliance, true-to-life color saturation and perfect renditions of subtle tones. The optical zoom brings the action close up from far away. In addition, precision digital zoom interpolation technology means that extreme digital zooming is clearer, with less distortion than previous types of digital zoom.